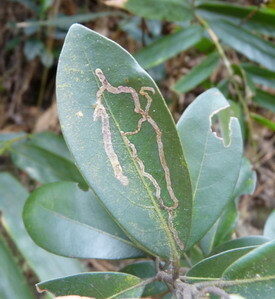 The picture above shows the trace left by Leaf miner whilst it’s eating the leaf tissue of Scaevola hainanensis草海桐. 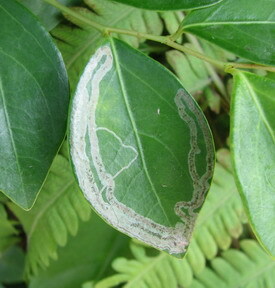 The larvae of Leaf miner live in and eat the mesophyll. They go through several instars and molting stadia and eventually push their way out through the foliage. The feeding tunnel shows the growth record of the larva. As the larva grows, the tunnel becomes wider. Droppings are left along the tunnel - from an initial one dot (entry) to the final big spot (exit) - and can be clearly visible. 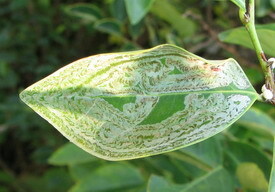 If time, you may keep track of the pattern on the leaf everyday as a record of growth. 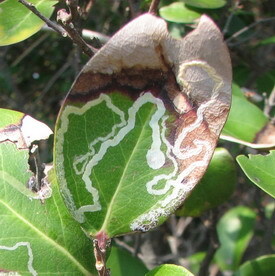 Leaf miners can be found in many species of plants. Breynia fruticosa (Chinese name: 黑面神, literally means “Black-faced God”) is an interesting plant. When its leaves fall off, it naturally turns black and that’s how it gets the Chinese name. 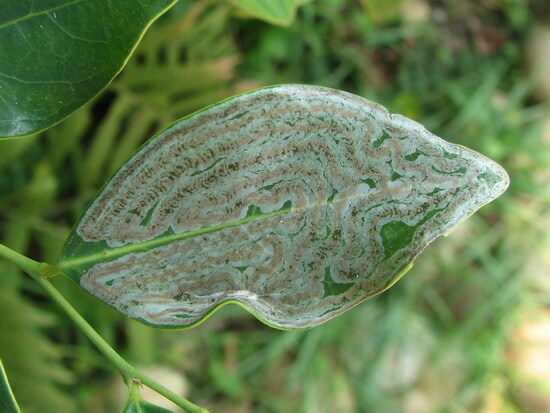 There is a more appropriate Chinese name 鬼劃符 (literally means ghost charm or illegible scribble) when leaf miners eat the leaf tissue and form a feeding tunnel, leaving damage pattern on the leaf surface – as shown in the pictures below. Whether the ‘charm’ is used by the ghost against human or the other way round is yet to be found out. 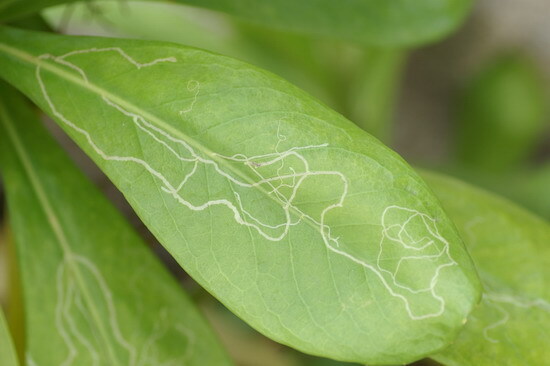 See the different damage patterns made by Leaf miners on Scaevola hainanensis, Litsea rotundifolia, Scolopia saeva, and Breynia fruticosa. The one on “Black-faced God” is made with the least resources but with the most ingenuity. The nickname of “ghost charm” is well deserved. Imagine that you are the larva. You cannot see the end of the mesophyll and just navigate like a headless chicken. 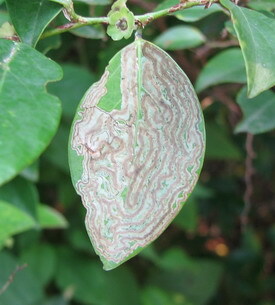 The time limit is when you are at the last bite of the mesophyll, you are in the final metamorphosis. How to make full use of all the resources in such a small leaf? You can follow the trail; turn around and across the vein. You will realize every turn is a tough decision to make. 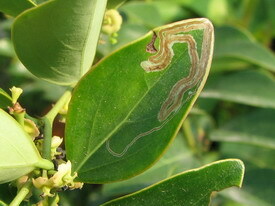 It looks as if the leaf miner of Black-faced God has its innate wit.